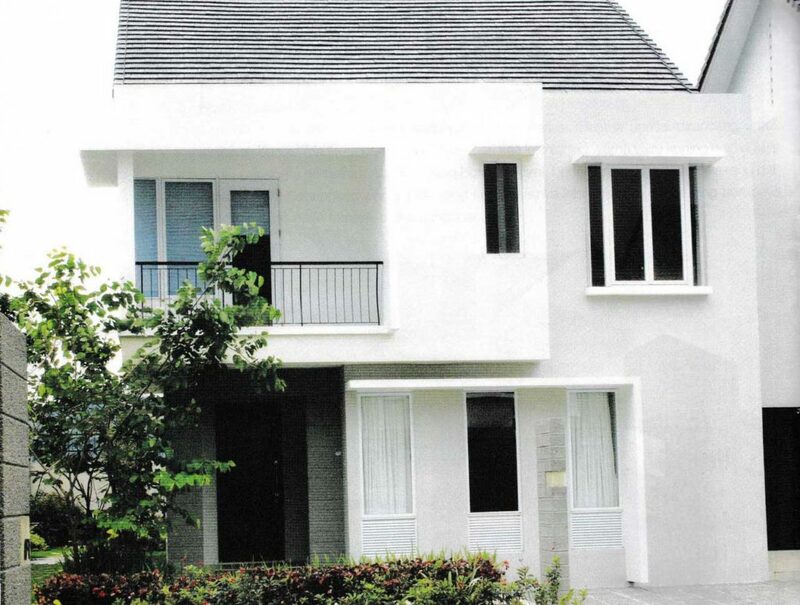 The facade of a house has an important role, because the beauty of a house is easily seen from the look on its face. Having a beautiful facade does not mean it should be expensive, through playing layouts, paints and using certain materials, the facade will look unique, beautiful, and economical. Use material that is the center of attention of the house, can be from wood or stone material. 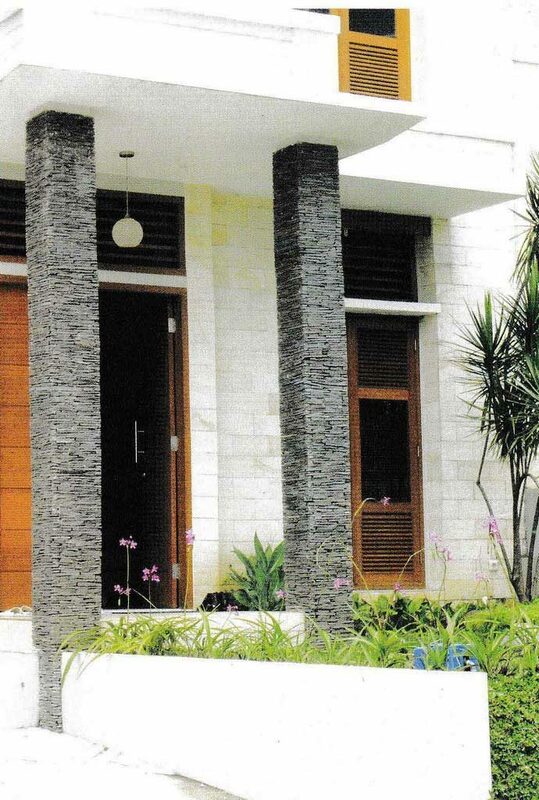 Using stone material in a small portion of the front house is not very costly and easy to maintain. To avoid the impression of being monotonous and reduce the volume of building area, use layout setting or masses, such as the position of the main bedroom more forward than the living room. Use color combinations for each segment or field. The right color combination for the front house will produces a home that is comfortable and nice to see. In color combinations, try to have strong and weak colors, colors can be taken from derivatives (monochromatic) or intentionally opposite to make it stand out more. Gable roof design is one step in saving costs. Using a type of flat roof tile is characteristic of modern minimalist buildings. 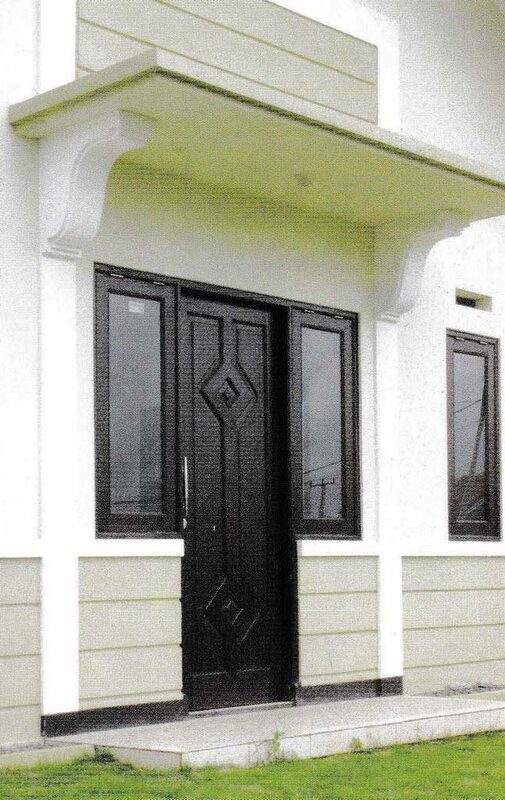 Canopies made of concrete will protect doors and windows that are directly exposed to the weather, so that the wood on the jamb or door leaf will be more durable and also cheaply maintained. Windows model with glass in the middle and jalousie/blinds above and below the glass. In addition to continuing the sunlight, this window model can create cross-ventilation in the room. The use of mechanical ventilation can be reduced. 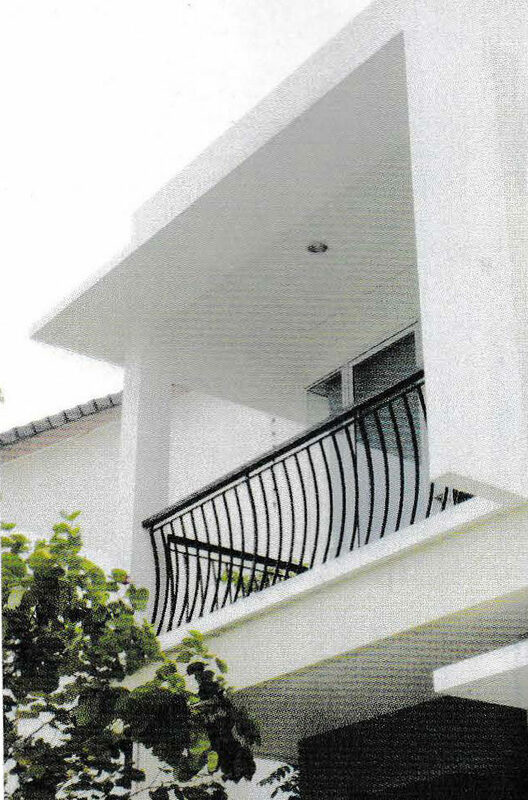 Balcony railing with a simple and inexpensive model in its manufacture, looks unified and beautifies the facade of the building. Some walls are given natural stones which make the facade more colorful. 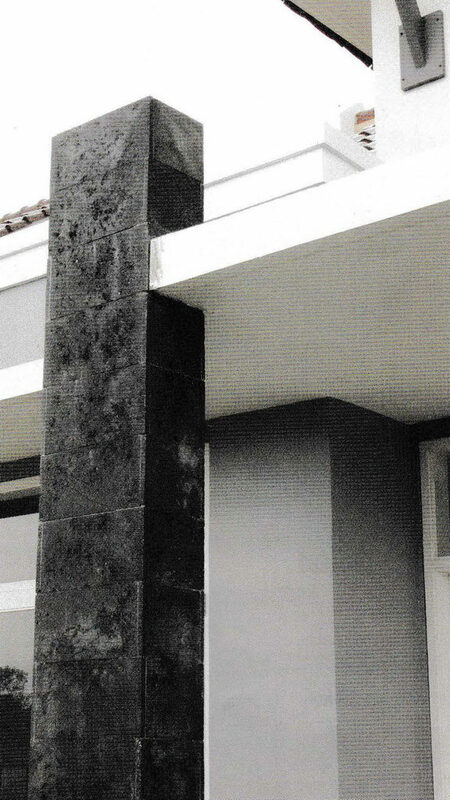 The placement of betel stacking stones in the column becomes an accent from the facade of the house. The use of stone stacking betel does not need to be dominant because the price will be expensive. The column will be the center of attraction of the entire facade. Although this house is classified as a small house, by setting the color arrangement, the facade of the house will be fresher and more pleasant to look at. A strong red color is not applied too much but was placed on the profile wall which will be highlighted. A neutral gray color is placed more to compensate for the strength of red color. 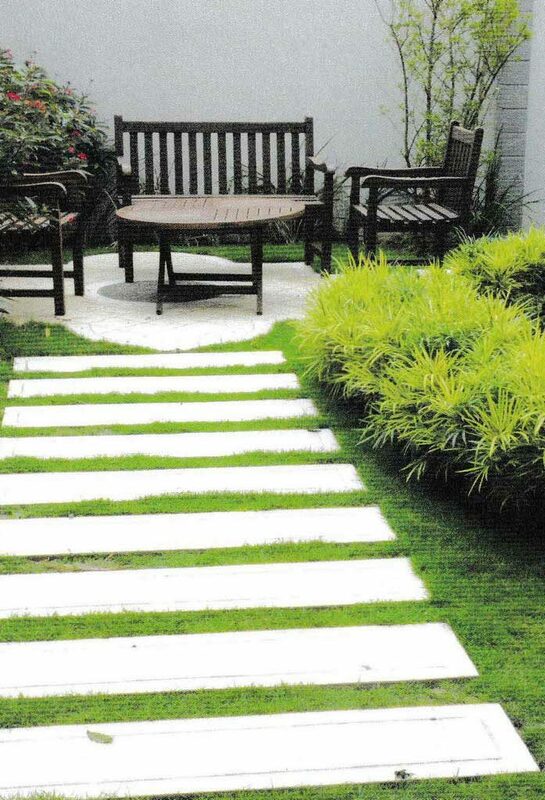 A white color to reinforce horizontal and vertical lines on that house. 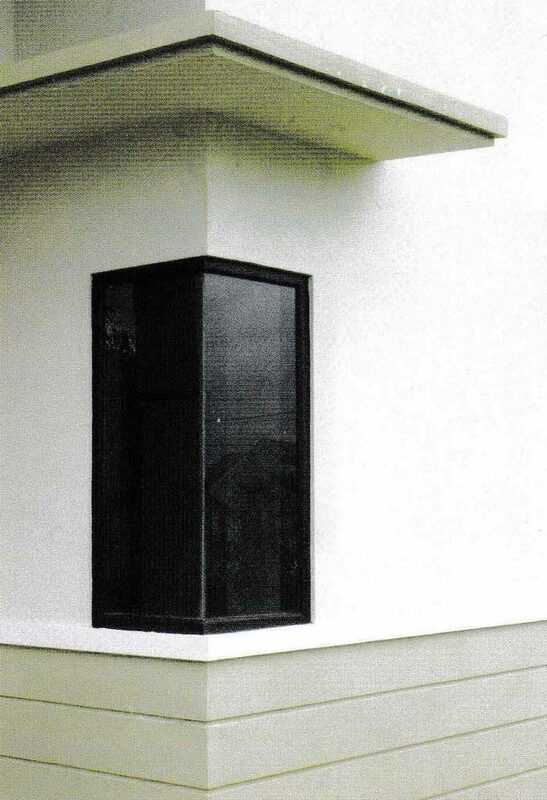 The use of a concrete canopy serves to protect the window from raindrop. 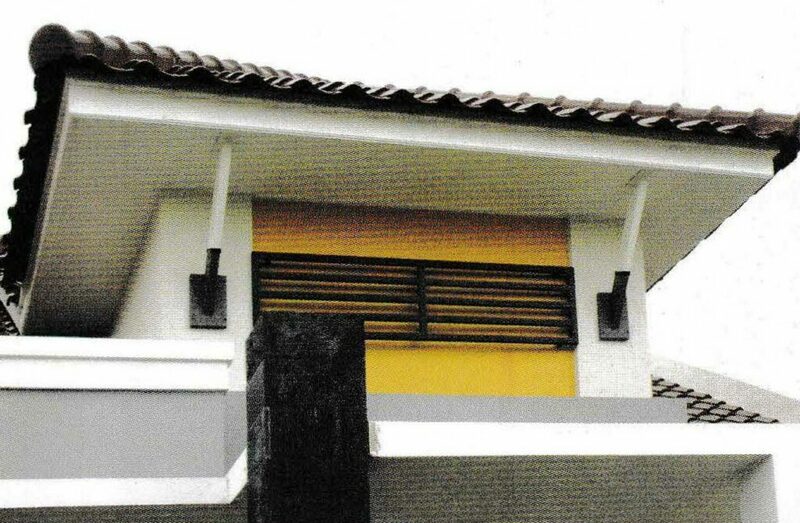 This canopy also functions as an accent for the facade of the house. 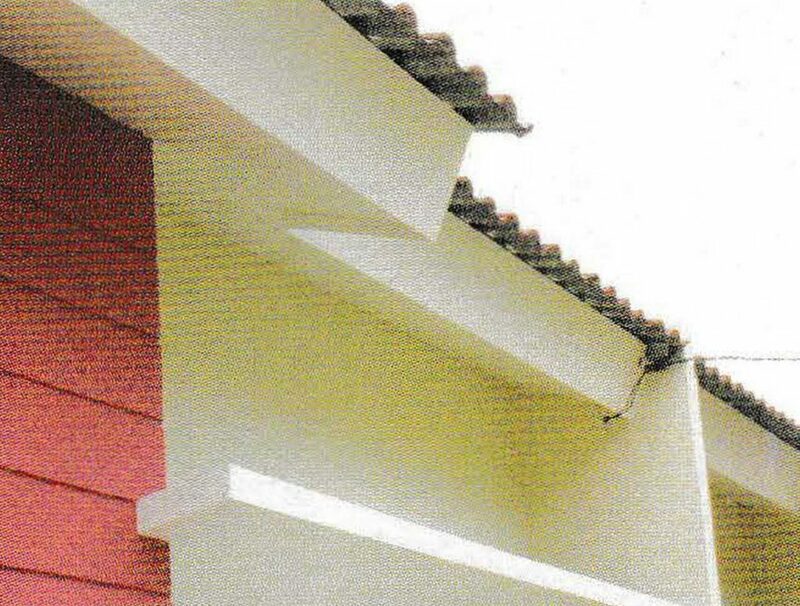 The use of synthetic materials for fascia board, besides being stronger and more beautiful, is also cheaper. For small house types, the use of light color gives a bigger impression, as well as a wall profile with a horizontal motif. A gable roof choice is the best way to saving money. 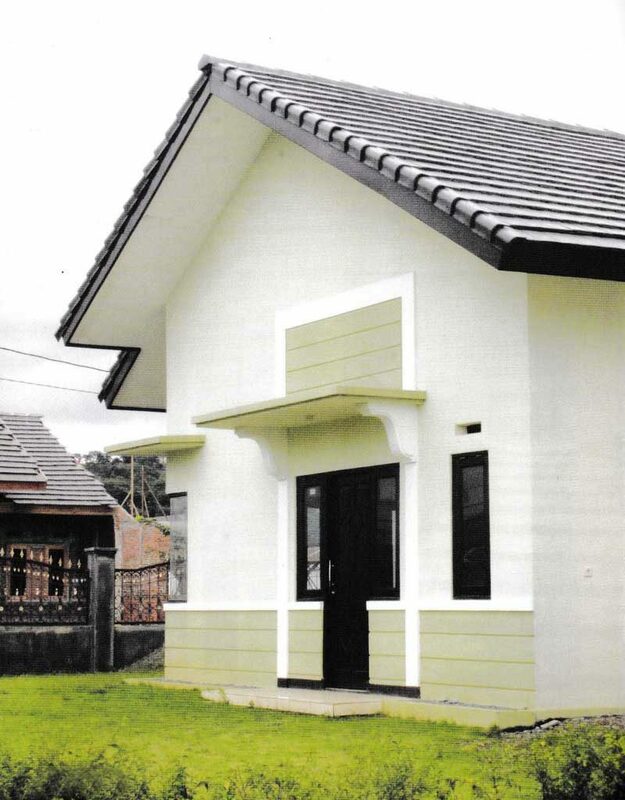 The use of a concrete canopy with sufficient length, in addition to protecting the doors and windows from rain, also to avoid leaking through the door gap at the bottom. 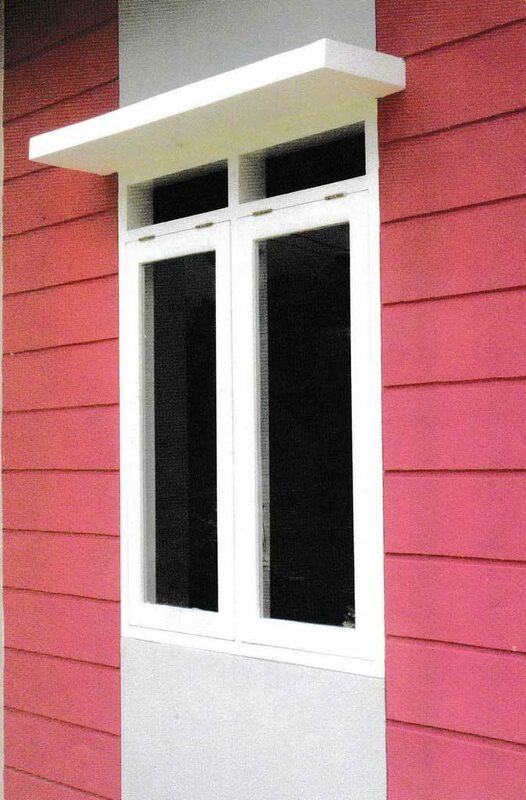 Elbow-shaped window jamb, in addition to saving wood usage, also get light and scenery from two different sides. 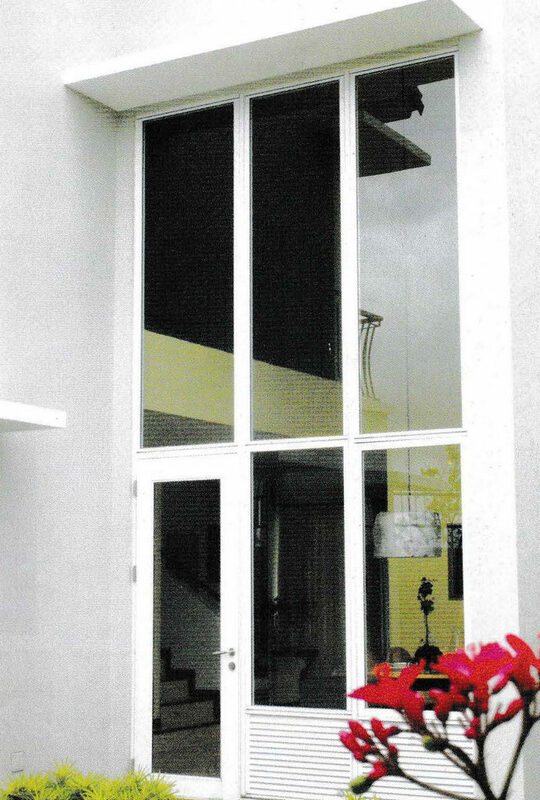 The window here is not only functional but beautify the appearance of the facade of the house as well. 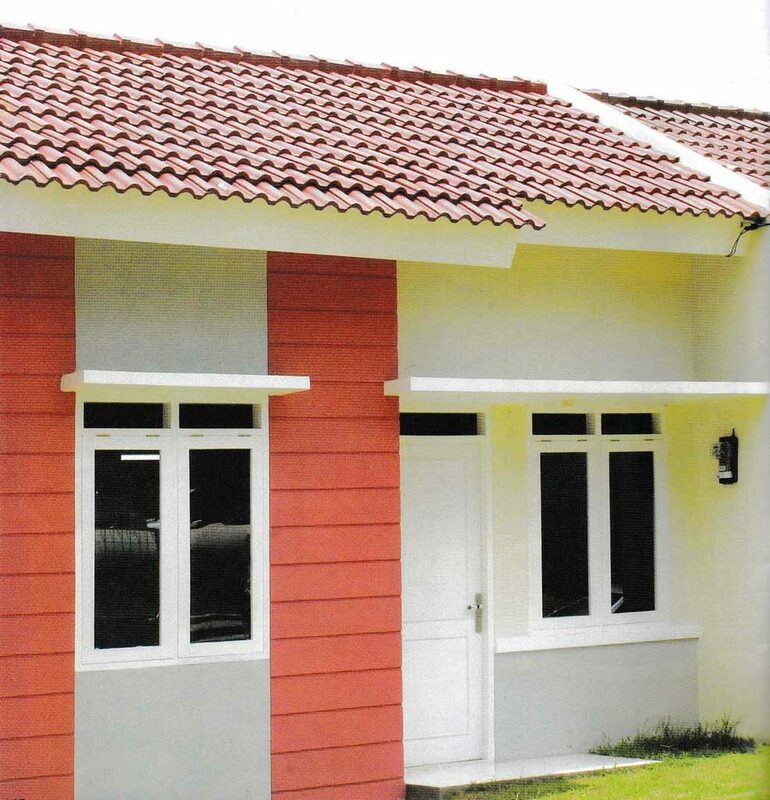 A frame with dark color finish will serve to give an effect of firmly lines on the facade of the house and is cheaper to do when compared to the pale color. Playing a mass with a square shape will feel dominant for the facade of the house. A living room should back off a bit from the master bedroom, while the balcony terrace should be jut out. Playing with fields makes the facade of the house look dynamic. Air ventilation, which is usually placed above the window, it is precisely installed under the window so the air circulation is more smooth. For windows that are not or less protected from the weather, choose the aluminum material that is given a coating is a very appropriate idea. Although it feels expensive at the beginning, but for the long term it will feel cheaper. Making stepping stone from plastering that is given stucco and profiled will looks beautiful. To reduce manufacturing costs, stepping stone can use the remaining sand sieve material. 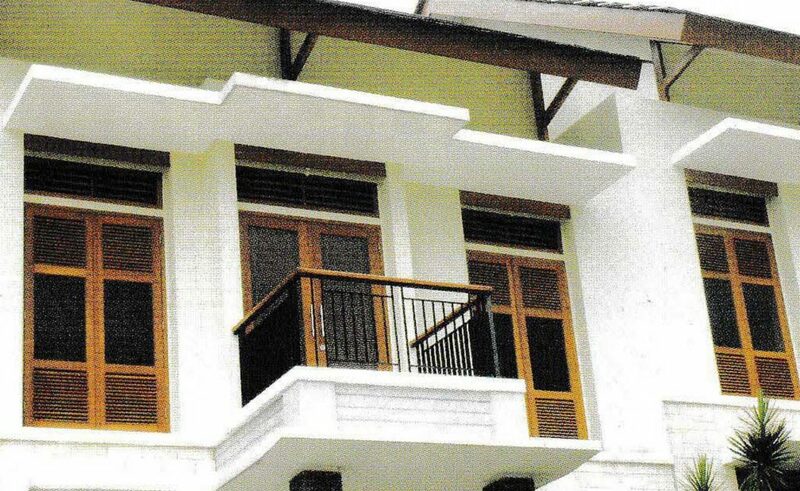 Simple and inexpensive railing form with little variation in the form of arches to reduce the stiffness of the house facade. 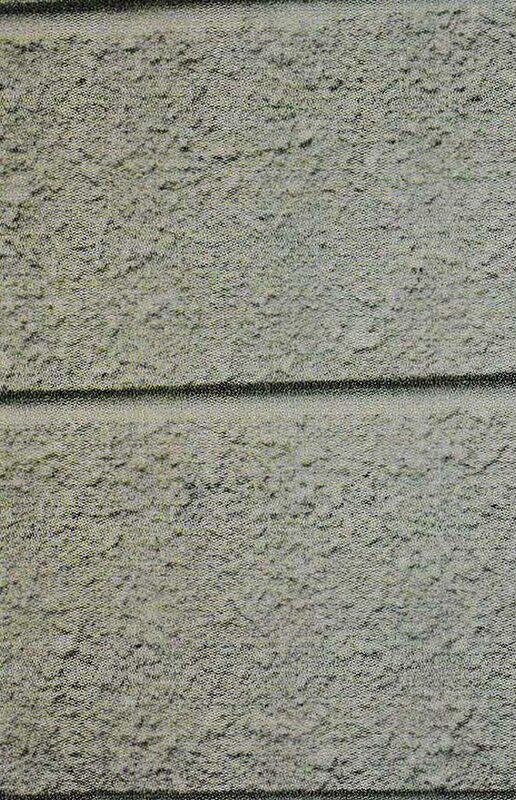 Plaster the wall with a grain effect technique, which is a wet stucco thrown onto a wall with a sieve, thus giving the effect of irregular spots. In addition to being cheap in its manufacture, it also makes the wall look monotonous. The roof of this house has two forms namely gable and shield. The shape of the shield is designed to accentuate the crown of the building. Consisting of three color combinations namely strong yellow color that is quite attention-grabbing. Gray is neutral, functions as a background and is not highlighted. While the pink color with more composition than yellow attempts to highlight the profile on the facade of the building. The addition of grill ornaments on the building’s crown makes it a focal point for the entire facade. 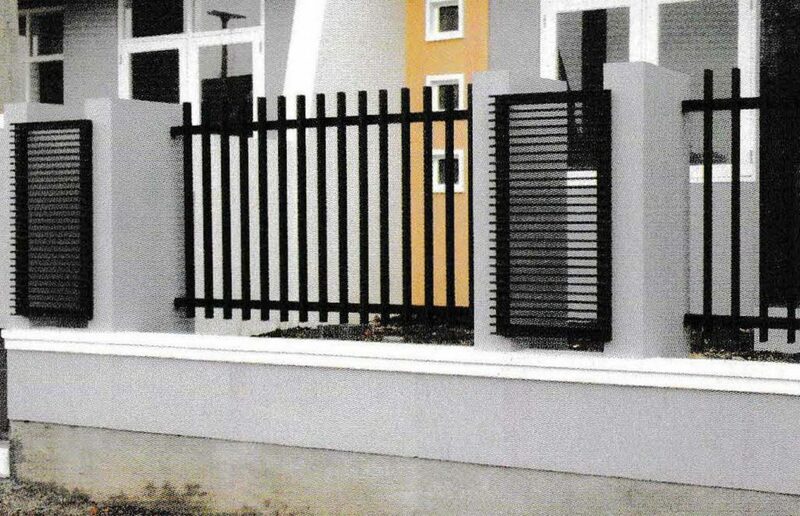 The fence design is striped with vertical and horizontal models. The use of material profiles with small dimensions is done to reduce manufacturing costs. Placement of natural stones is only in one column and made asymmetrical with one side, so the cost of making is not too expensive but beautiful. So, if you wish to have all these awesome graphics about Building Facade for Modern Minimalist Home Projects, click on save link to download the graphics to your laptop. They are all set for obtain, if you’d rather and wish to have it, just click save badge in the article, and it will be immediately saved to your laptop computer. 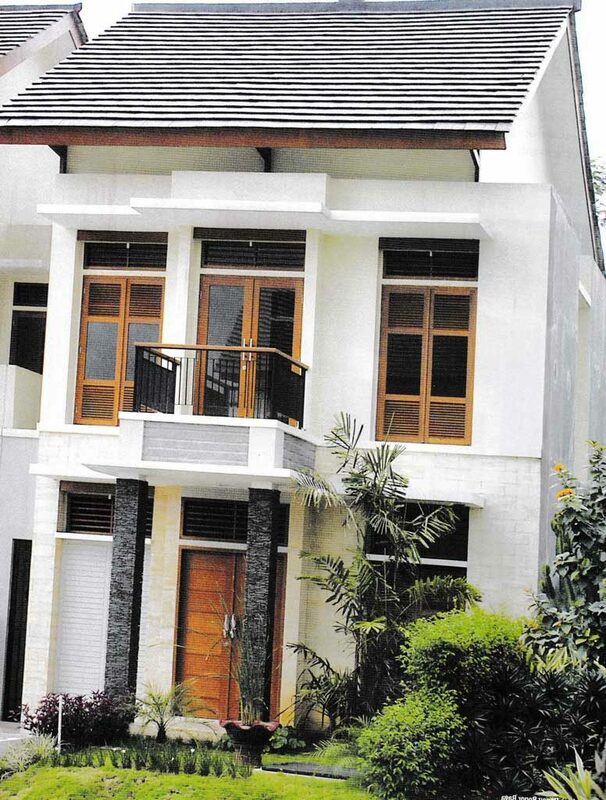 Here you are at raysahouse.com, article above Building Facade for Modern Minimalist Home Projects published. 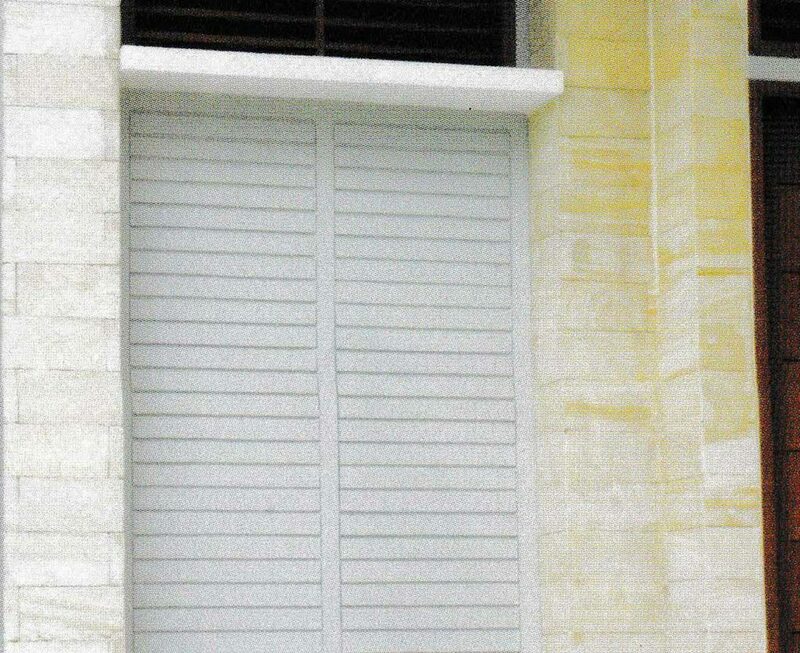 Many individuals looking for details about Building Facade and certainly one of these is you, is not it?